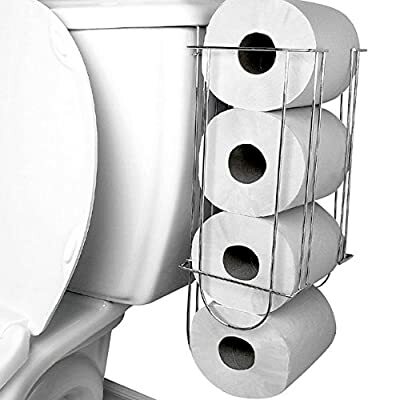 No more getting up to search for your toilet paper, with this side-of-tank toilet paper storage rack they will always be within reach! The extra rolls are also convenient for guests so they don't have to go digging through your cupboards. The toilet paper holder dispenses rolls from bottom. Great way to save some additional space in your bathroom! Installation requires no tools. Simply lift the tank top and slide the bracket on. Goes with just about any bathroom decor! Holds up to 4 standard sized rolls of toilet paper. Made out of durable rust resistant polished chrome-plated iron. Ideally fits over top of rectangular tanks no thicker than 1/2 an inch. Constructed, measures approximately 5 inches in length by 5.3 inches in width by 17 inches in height. Comes with your choice of 1 or 2 side of the tank toilet storage racks. Toilet paper will always be within reach. Comes with your choice of 1 or 2 side of the tank toilet storage racks. Toilet paper holder dispenses rolls from bottom. Holds up to 4 standard sized rolls of toilet paper. Measures approximately 5 inches in length by 5.3 inches in width by 17 inches in height. Chrome-plated metal design hooks directly onto toilet rectangular toilet tanks.